Just Change tea grown by a tribal co-operative in Gudalur, in the Nilgiri Hills, South India, has been available in Oxford for some time. Now we are delighted to announce the arrival of Just Change Spices – including cardamom, chilli powder, turmeric, peppercorns, cumin, coriander, cinnamon, cloves plus ground ginger. There will be a cookery demonstration to give you some ideas about how to use the spices in curries, masala chai and hot mulled apple juice – which you are welcome to taste. 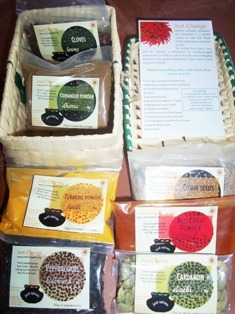 Gift baskets and loose packs of individual spices – as well as tea – will be available to buy, at a fair price for the producers and for you. Dr Alex Nicholls MBA, lecturer social entrepreneurship at University of Oxford’s Said Business School, will discuss the benefits and challenges of the revolutionary Just Change trading system. Dr Nicholls is co-author of a major research book on Fair Trade (with Charlotte Opal, Sage, 2005) and the editor of a collection of key papers on social entrepreneurship (Oxford University Press, 2008). This entry was posted on Sunday, October 16th, 2011 at 12:52 pm and is filed under Events, Producers. You can follow any responses to this entry through the RSS 2.0 feed. You can leave a response, or trackback from your own site.